This part of Saul’s story is just weird. Several times now it has mentioned that “an evil spirit from the Lord” came upon Saul at various times, causing him to try to kill David, which is strange enough. But now this! It’s not a well-known part of the story, so in case you’re not familiar with it, Saul has started his campaign to kill David. Michal, David’s wife, found out about the plan, warned David, and tricked the assassins to but David some time. Anyway, David escaped and sought refuge with Samuel. 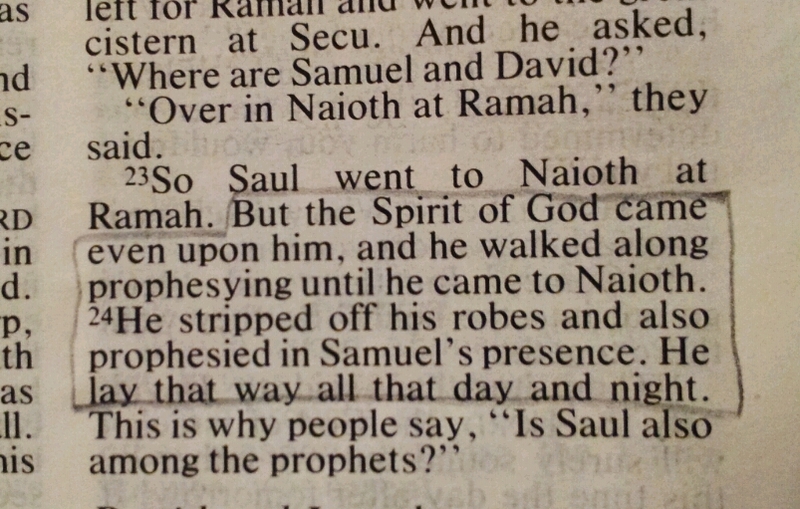 Saul found out and sent men to kill him there instead, but when they approached they started prophesying. So Saul sent another lot, and they too started prophesying. When the same thing happened for a third time, Saul gave up and went himself, and lo and behold, he started prophesying too! I’m not sure exactly what is meant by ‘prophesying’ here – predicting future events or revealing things of God or what – but whatever it is, Saul was overcome by the Holy Spirit and was unable to carry out his plans. I love the phrasing of it: “the Spirit of God came even on him”. What a wonderful assurance – even the one from whom God had withdrawn his favour, the one who was trying to kill God’s anointed one – even he was not beyond the reach of God’s Holy Spirit. I think the lessons here are that God can speak his word through anyone, but that even the touch of his Spirit doesn’t always bring about repentance – if you know the rest of the story, you’ll know that this wasn’t a permanent transformation in Saul’s life; he soon went back to his wicked ways. For this moment, though, God was able to use him. And God was willing to use him. I think Saul had a choice of whether to repent and turn back to God at that point, but chose to nurture his jealousy instead, but God’s grace was freely offered to him in spite of it all. I find that really interesting too. I was just reading in the NT how Caiphas prophesied about Jesus and it says it was because it was his job as High Priest nothing to with his gifting or righteousness. God does not work as we expect or according to the rules we lay down for him. Ooh, that is interesting (about Caiaphas, not about you forgetting to tick the box!). It means we need to be careful about assuming that a person who has a prophetic gift must therefore be Godly and trustworthy in all other areas, doesn’t it? Yes, that’s right. And there’s that strange bit about the disciples saying to Jesus about people who are doing healings and stuff in his name but aren’t disciples and Jesus says don’t stop them because they must be on the right side if they’re not against him. I’ve always found that very difficult because how do you know who to trust.